"Don't worry. I'm sure everything will work out just fine." Truth is, not everything works out just fine. Sometimes we lose. Sometimes we miss out. Sometimes we hurt...and hurt some more. Sometimes everything works out really badly. But I've learned that while everything may not be okay, I can be okay. I learned that when I reached for Holley Gerth's book You're Going to be Okay. I loved Holley's encouraging book because she not only cheers you toward hope in it, but she gives you practical tools to help you get there. You have to meditate on truth in order to change your thinking and your feelings, so that you can, indeed, be okay. I teach that very concept at the Satisfied at Last Conferences I've been presenting in churches and conference centers all over the country for the past three years. I encourage women to search out scriptures that feed their soul hungers for things like love, significance, purpose, and security, and to chew on those biblical truths three or more times a day through meditation. But sometimes, when a difficulty or unusual life change occurs, we flounder for truth. Because of hurts, disappointments, and rejections, we find ourselves not just hungry for truth, but starving for it! And if we don't lay hold of some truth fast, we end up swallowing the lies surrounding those unwieldy circumstances instead...causing even more hurt and frustration. In recent months I've been starving for truth. Satan has aimed an arsenal of lies in my direction and pulled back his bow with full strength, targeting my wounded and insecure heart. And that's why Holley's newest book, What Your Heart Needs for the Hard Days, has been such a lifesaver for me. Holley has given us 52 well chosen, encouraging truths to hold on to when the difficult days come. I can tell that Holley is no stranger to hurt and disappointment because she has selected scriptures from the Psalms that soothe and gently encourage. She offers no platitudes or empty promises, only scriptural truth full of holy hope and grace. Remember, she has 46 more biblical and hope-inspiring truths where those came from. In fact, if you'd like, you can have one for each week of the year. I like to fill a scripture memory and meditation album with soul-satisfying scriptures that feed my current hungers and voids. I explain how to do that here. But the basic jist is to slowly (as you find them) add satisfying truths to your 4x6 photo album on 4x6 index cards. I keep the album with me throughout the day and read through it several times daily, and even memorize the scriptures over time. Holley says, "Jesus is looking at you and loving you. He's reaching out his hand to cup your chin and lift your face so you can look into his eyes. What happens when we lift our heads? Our perspective changes." Holley writes, "We will never know all God has shielded us from...What we do know and can trust in with all our hearts is that he was willing to die on a cross to protect us. And that means he's committed to our well-being." I'm pretty diligent about digging into God's Word for life-changing scriptures for myself, but during this season of change and hurt I have welcomed Holley taking me by the hand and leading me gently to well-chosen and meaningful verses that have fallen fresh on my famished soul. 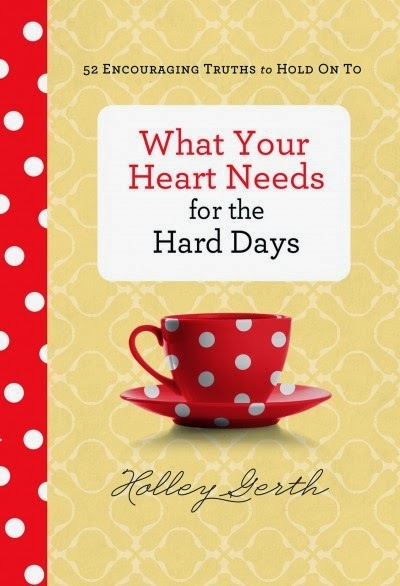 For the first time, Holley will be hosting a book club featuring What Your Heart Needs for the Hard Days. You can find out more about it here. All you have to do to join is like her Facebook page here. I have absolutely loved this little book. It makes a great gift for a hurting or grieving friend, but I think it's one you'll want to have on your own nightstand as well. Have you read any of Holley's books? Do you have a favorite?